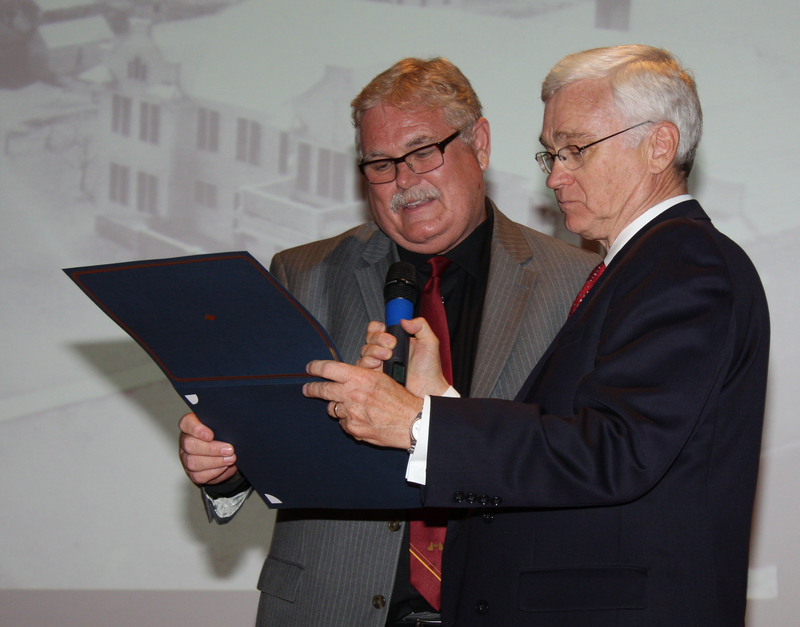 English Professor Andrew Woolley was recognized for 35 years of teaching at Southwestern. University President Eric Anderson (right) congratulates Bill Kilgore for his Extra Mile Award. Ten Southwestern faculty and staff were honored for their service to the University and its students at the annual Awards Dinner, held on Wednesday, Aug. 14 on campus. In addition, two employees, one faculty and one staff, were singled out for the Extra Mile Award for meritorious service. Bill Kilgore, professor of religion, and Sharon Wicker, accountant in the business office, received the annual Extra Mile Award. Their awards, presented by University President Eric Anderson, cited Wicker for “exemplary service, steadfast integrity and always knowing where the treasure is buried.” Kilgore’s award recognized him for “exemplary service, and being an outstanding ‘bishop,’” then citing in Greek the qualifications listed in 1 Timothy 3:2 for church leaders. Receiving awards for ten years of service was Rachel Durichek, while Glen Robinson, Darla Sullivan, Greg Sullivan and Edna Yanez-Perez were recognized for 15 years of service. Jeanne Mizher received a 20-year award. Ellis Hainey was honored for 25 years of service, and Art Chadwick and Bev Mendenhall received recognition for 30 years of service. 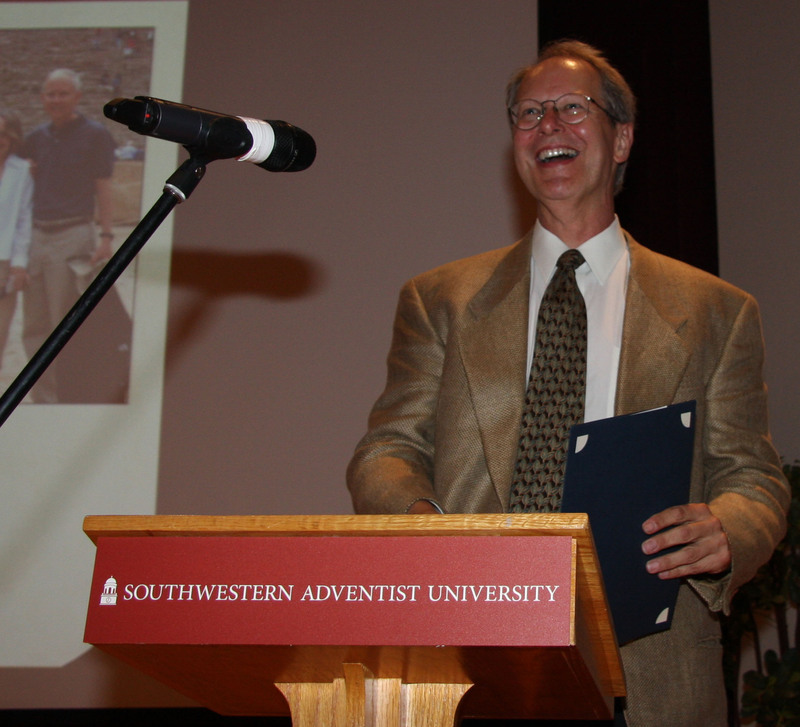 Finally Andrew Woolley, professor of English received an award for 35 years of service at Southwestern. 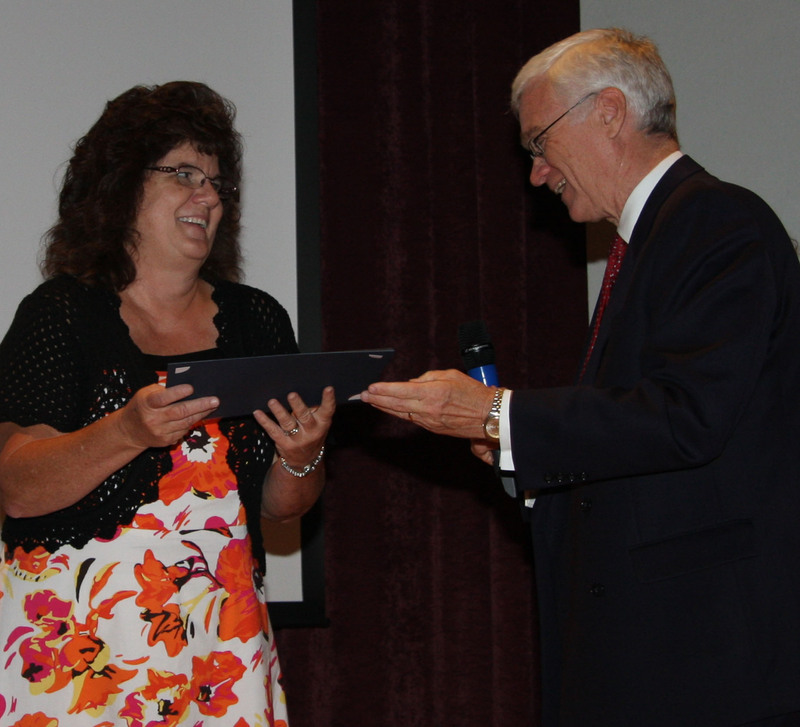 Sharon Wicker receives her Extra Mile award from President Eric Anderson.